Water allocation in the Upper Klamath Basin has become difficult in recent years due to the increase in occurrence of drought coupled with continued high water demand. Upper Klamath Lake is a central component of water distribution, supplying water downstream to the Klamath River, supplying water for irrigation diversions, and providing habitat for various species within the lake and surrounding wetlands. Evapotranspiration (ET) is a major component of the hydrologic budget of the lake and wetlands, and yet estimates of ET have been elusive—quantified only as part of a lumped term including other substantial water-budget components. To improve understanding of ET losses from the lake and wetlands, measurements of ET were made from May 2008 through September 2010. The eddy-covariance method was used to monitor ET at two wetland sites continuously during this study period and the Bowen-ratio energy-balance method was used to monitor open-water lake evaporation at two sites during the warmer months of the 3 study years. Vegetation at one wetland site (the bulrush site) consists of a virtual monoculture of hardstem bulrush (formerly Scirpus acutus, now Schoenoplectus acutus), and at the other site (the mixed site) consists of a mix of about 70 percent bulrush, 15 percent cattail (Typha latifolia), and 15 percent wocus (Nuphar polysepalum). Measured ET at these two sites was very similar (means were ±2.5 percent) and mean wetland ET is computed as a 70 to 30 percent weighted average of the bulrush and mixed sites, respectively, based on community‑type distribution estimated from satellite imagery. Biweekly means of wetland ET typically vary from maximum values of around 6 to 7 millimeters per day during midsummer, to minimum values of less than 1 mm/d during midwinter. This strong annual signal primarily reflects life-cycle changes in the wetland vegetation, and the annual variation of radiative input to the surface and resulting temperature. The perennial vegetation begins each growing season submerged, emerges from the dead litter mat around late May or early June, reaches a maximum height of about 2.2 meters (m) during summer, senesces in October, and subsequently lodges over, contributing to the dead litter mat from previous years. Hydroperiods last about 5 to 6 months, typically beginning in January or February and ending in July or August, and have a minor influence on the annual ET cycle. These hydroperiods result from lake levels that typically vary about 1.3 m, from around 0.6 to 0.9 m above the wetland surface, to around 0.4 to 0.7 m below the wetland surface. An estimate of 3-year annual wetland ET, made by substituting early- and late-season data measured during 2009 for the missing periods in early 2008 and late 2010, is 0.938 meter per year (m/yr). Daily values of alfalfa‑based reference ET (ETr) were retrieved from the Bureau of Reclamation AgriMet Web site (http://www.usbr.gov/pn/agrimet/index.html) and are aggregated into biweekly, annual, and 3-year values (for consistency, the 3-year values are also computed using substitute data from 2009 for early 2008 and late 2010). These ETr values are computed from weather data measured at the nearby Agency Lake weather station (AGKO), and are based on the assumption that the alfalfa crop is green and vigorous year-round. The 3-year value of ETr is 1.145 m/yr, about 22 percent greater than wetland ET. A comparison of 2008–2010 alfalfa and pasture growing season actual ET with wetland ET is made using data from the more distant Klamath Falls AgriMet weather station (KFLO) because actual alfalfa and pasture ET are not computed for the AGKO site. During the 190-day average alfalfa growing season, wetland ET (0.779 m) is about 7 percent less than alfalfa ET (0.838 m). During the 195-day average pasture growing season, wetland ET (0.789 m) is about 18 percent greater than pasture ET (0.671 m). Assuming alfalfa and pasture ET are equal to wetland ET during the non-growing season, annual estimates become 0.997 m, 0.938 m, and 0.820 m from alfalfa, wetland, and pasture, respectively. Wetland crop coefficients (Kc = ET/ETr) are computed at daily, biweekly, and annual time steps. Approximate formulas are given to estimate daily values of growing season Kc, thereby allowing computation of daily growing season ET using ETr from the AGKO weather station. Biweekly values of growing season Kc are computed from ensemble average values of ET and ETr during the 3 study period growing seasons, and a single, mean Kc is computed for the non‑growing season. Together, these provide relatively accurate estimates of biweekly ET during the study (RMSE = 0.396 and 0.347 mm/d, r 2 = 0.962 and 0.971 at the bulrush and mixed sites, respectively). A fourth-order polynomial fit of the biweekly growing season values to day of year provides a more automated form of ET computation. Measured ET at the bulrush wetland site during the current study compares very closely with growing-season ET estimated during a study in 1997 at nearly the same location. During the earlier study, ET was measured four times, using eddy covariance for 1- to 2-day periods, and was estimated between measurement periods using a Penman‑Monteith model, calibrated to the measurements. Differences between time series of ET from the two studies are similar to interannual differences within the current study. Compared to the 1997 study, the current study measured larger ET rates in early summer and smaller rates in late summer, resulting in very similar growing-season totals. A study conducted in 2000 estimated ET from nearby fallowed cropland, using the Bowen-ratio energy balance method supplemented with Priestley-Taylor and crop‑coefficient ET modeling. Seasonal timing of ET from three different crop types varied considerably, but growing‑season totals were remarkably similar, at 0.435 ± 0.009 m. Wetland ET measured during the current study, evaluated over the same growing season was 0.718 m, or about 65 percent greater than the fallowed cropland ET. 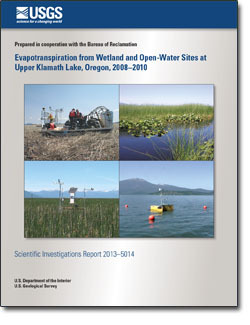 Open-water evaporation from Upper Klamath Lake was measured at two locations during the warmer months of 2008–2010 using the Bowen-ratio energy balance method. Measured rates were in general agreement with those measured in 2003 using the same method. Open-water evaporation and wetland ET were nearly equal during late June through early August, when wetland vegetation was green and abundant. As expected, open-water evaporation consistently exceeded wetland ET during late summer, as wetland ET responded to vegetation senescence while open water evaporation responded to extra available energy in the form of heat previously stored in the lake. Overall, open‑water evaporation was 20 percent greater than wetland ET during the same period. Stannard, D.I., Gannett, M.W., Polette, D.J., Cameron, J.M., Waibel, M.S., and Spears, J.M., 2013, Evapotranspiration from marsh and open-water sites at Upper Klamath Lake, Oregon, 2008–2010: U.S. Geological Survey Scientific Investigations Report 2013–5014, 66 p.